On November 30th, the school lost a vibrant and passionate member of its community. In the wake of a tragedy, Murrow students and administrators took the time to reflect on Dr. Zelman Bokser’s spirit and legacy as a talented violinist, music teacher and a wonderful friend. Dr. Zelman Bokser was a musician by training and inclination and earned his doctorate from the Eastman School. He was a violist, a composer and a conductor. He taught and conducted at the college level for years, and then spent some time in Taiwan. He returned and spent the last 20 years or so teaching in the NYC public school system. 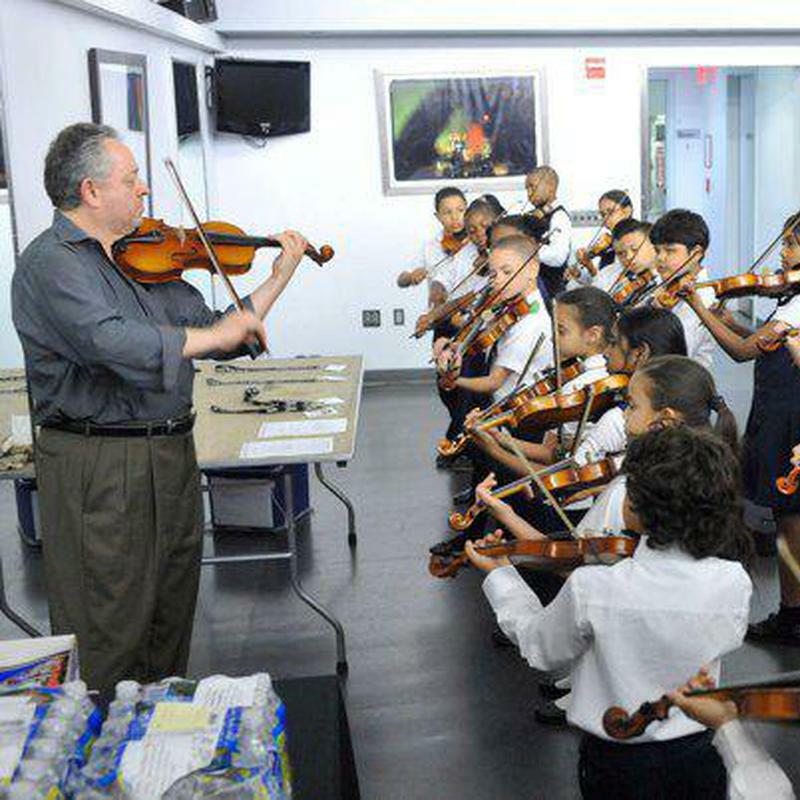 He brought violin programs to elementary schools in Bushwick and Sunset Park as well as being the beloved music teacher and conductor we got to know here at Murrow. Dr. Bokser loved traveling, music, wine, good food and loving company. He will be deeply missed. He was 67 years old and is survived by his sister Izzy Bokser, his wife Danny (I Ling Huang) and her son Allen (Wei Sheng Meng). Students of Dr. Bokser described how he changed their lives and pushed them to be their best. Alexandria Morales, a junior music student, took one of Dr. Bokser’s classes last year. “He was someone who meant a great deal to me. Although he was only my teacher for one year, he played a large part in my music. For a period of time, I lost my love for music and was only playing it for school. When I met Dr. Bokser, he shined a new light on to music because I saw the passion he had for it, and the way he wanted to instill that passion in his students. I’m very grateful to have known him as a person and have him as a teacher. At his funeral service, his students were told that he loved us and that we were his passion.” Morales said. Senior Zaina St. Louis Small, a viola player, was also heavily impacted by Dr. Bokser’s teaching. Another student of his, Diamond Renderos, reflected on her time with Dr. Bokser as a teacher. “I picked up the violin in third grade, but when I auditioned for Dr. Bokser’s class, that’s when I started to really play music. He gave us pieces from Tchaikovsky, Beethoven, Handel and so much more. He loved all of his students and joked with us. When he told us he had stage four lung cancer, he comforted us and remained optimistic. He told us not to worry because he was going to take all his medication and go to all of his appointments. At that moment, I realized how lucky I was to have him as a teacher. When he had to get surgery a week before Thanksgiving, he was in pain yet still conducted our class. All of his students loved him as much as he loved us and some even viewed him as a father figure. We will all miss the way he walked, his squeaky voice when he yelled at us, his green coat, the way he smiled when conducting, the grunts he made to make us laugh, and his reminders to make sure we were breathing. But most of all, we’ll miss the way he loved each of us. We love you, Dr. Bokser,” Renderos said. Even students who didn’t have a very personal connection to Dr. Bokser, shared their thoughts during this difficult time. Staff member Tom Toriello, AP of the music department, reminisces over his time working with Dr. Bokser.